less is more: goodbye, 24. Tomorrow is my 25th birthday, which means not only a wrap-up of my 25 Things list, but also a new list (26 Things to come tomorrow*), and a year of exciting things that happened. 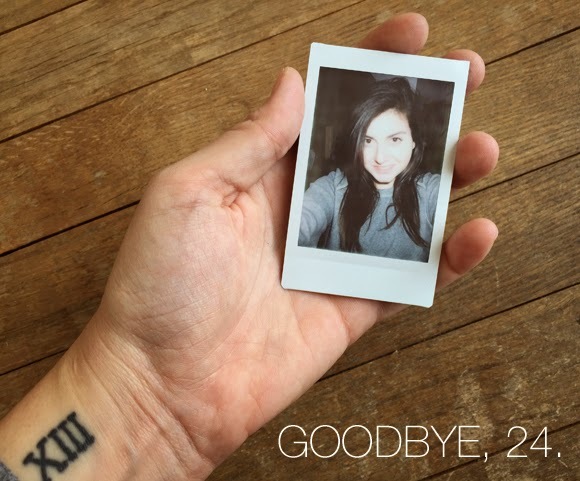 When I said goodbye to 23 last year, I don't think I could have predicted how much would change for me. Some of the things that I loved in my 24th year have little to no hold on my life now, and some of the small things have a stronger hold than ever. So in saying goodbye to 24 now, I feel like there were a lot of little moments, which are always, of course, my favorite, but there were some really big ones that made my 25th year a difficult, but important one. 1// I spent thirty days on my favorite blog project so far, which was literally just finding fun ways to take pictures of coffee. 2// I discovered the beauty of the shutter remote, and am forever changed. 3// My grandmother passed away in December, and in the chaos that was losing a loved one over Christmas, my entire family got to spend an amazing three days together celebrating her life, and thinking about all of ours in conjunction with each other going forward. 4// Finally finished my first year of project life completely, which made starting my new one really exciting. 5// I spent most of my 25th year focusing on the word grow, and have chosen to expand on that this year with the word adapt (see more about One Little Word here). 6// I met two of my blogging idols, Elsie + Emma of A Beautiful Mess. 7// I discovered my new favorite thing ever is using gold paint markers on white canvases (exhibit a & exhibit b). 8// I made a bunch of new friends, but two new besties that I clicked with so fast, we couldn't have planned it to be a more perfect match. 9// Finally got a new radio for my car. While this may seem like the silliest little highlight of this year, it has made life so much easier (no more mix CDs for me! Hello, the future). 10// I tried ten new restaurants around Long Island (and a few in NYC), plus a few breweries nearby, which has expanded the list of things to do at home a bit (it's usually a very short list, indeed). 11// My long-time Halloween costume idea finally came to fruition this year, and I want to be the same thing every year for the rest of my life. 12// Ate a Donut Plant pistachio doughnut, and my life is so much better as a result. 13// Rang in the new year like this. 14// Went on the most amazing trip of my life through Europe with two of my best friends. 15// I discovered my favorite nail color (and honestly my favorite color, period). 16// This was the year that I finally figured out what I want to do with my life. This. Writing. Telling Stories. Connecting with people through the written word. I want all of it, and though I wish I figured out all of this sooner (say, senior year of high school when I had to pick a major), I am embracing the crazy now and making a real go of it. 17// I got my fifth tattoo in six years, and have kept with the tradition of never getting more than one in the same age year. 18// Got to spend a weekend in Montauk with my friends right at the end of the summer, which was probably the best summer send-off of my life. 19// I went to a vineyard for the first time, and seeing as wine is my first true love, it was a solid, though messy experience. 20// Flew to England for ten days to finally spend some time with my best friend. I seem to love having the people I love be in another country. 21// I read I'll Give You The Sun, and it made me feel all of the feelings. It is the type of book that I would love to be able to write one day, and reading it has made me more excited about that. (Notable mention for book of the year goes to Still Alice, which was also absolutely incredible). 23// After a brief three month hiatus at BuzzFeed, Max is still in my daily life, which I could not be happier about. 24// Skylar Fallyn was born around my half birthday, and even though I was nervous before she arrived that I wouldn't be able to fit enough love in me for both Max and her, she's stretched my heart to triple its size. Couldn't be more in love with her. 25// Though only about half of the things on my 25 Things list got completed or started, having the list on my mind all year really helped me to think about goal setting in the future and what types of goals are important to me as I grow and change. It was a good experiment, and I'm going to continue it and try to make more attainable goals, as well as goals that I really want to see myself work toward in the upcoming year. Saying goodbye to the first quarter century of my life, and hoping this next year will be full of more of these little moments.